The Federation gothic building at 137 St Georges Terrace is one of Perth’s most recognisable old buildings. It is also connected with the history of Curtin University, having originally housed the Perth Technical School, Curtin’s earliest predecessor institution. The building is located on the traditional land of the Whadjuk people of the Nyungar Nation. In March 1833, four years after the settlement of the Swan River Colony, the site was used by Whadjuk Nyungar people to welcome two Minang Nyungar people from Albany, who had travelled to Perth aboard the Government schooner, Champion. An account published in The Perth Gazette, and Western Australian Journal, describes the Whadjuk Nyungar people performing a corroboree, in which the theme was a kangaroo hunt, for the guests, with Yagan himself acting as “master of the ceremonies”. 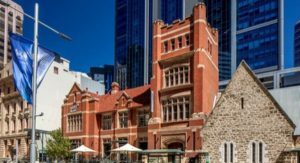 The building at 137 St Georges Terrace was constructed in the Federation gothic style in 1909-10 to meet the demand for student places at Perth Technical School, which had previously been operating out of the Old Perth Boys’ School at 139 St Georges Terrace. The school, which would later be renamed Perth Technical College, offered voluntary classes for trade apprentices and others possessing an occupational qualification. After World War Two, the demand for technical training dramatically increased. Perth Technical College split in two, with half forming the basis of the new Western Australian Institute of Technology (WAIT) – Curtin’s predecessor institution – and the other half remaining as a technical college. In 1966, WAIT officially opened, relocating from the building and other premises in Perth to its new campus in Bentley. In 2018, Curtin University transformed the building into a modern learning space that will deliver its professional learning programs and select postgraduate courses. Along with a presence at 139 St Georges Terrace, our student and event space, the University is able to celebrate its history while strengthening its presence as a professional education provider in the heart of the Perth central business district.